Eco Christmas tips that inspire you to begin some earth friendly Christmas traditions. If you're dreaming of a GREEN Christmas try some of our simple environmentally friendly strategies to keep you celebrating the holidays without the dubious environmental by-product. People in-the-know are trading in some of their old Christmas traditions for planet healthy alternatives that provide all the sparkle and glamour of Christmas at a fraction of the cost... financial and environmental. Here are some simple tweaks and timely Christmas tips to make your holidays fun and fabulous... and friendly. You'll be sure to find eco methods and products for celebrating, gift giving, decorating, entertaining... all the merry aspects of Christmas. 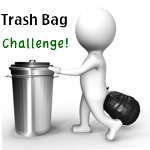 - Choose wrapping materials that can be reused or recycled or that have been made from recycled materials. Gift bags are a good choice because they can be reused a number of times and it's so easy to pack an awkwardly shaped gift in them. Recycled gift wrap is a perfect way to minimize your Christmas footprint. We've been saving gift wrap for more than 30 years. Before there was ever a green movement it still didn't make good sense to throw all those pretty papers, ribbons and bows. Recycle it again recycled again (some can even be composted). I like to use a part of the gift itself as the wrapping, a colorful scarf or pareo, handkerchief or tea towels for kitchen ware. Make the wrapping a part of the gift - Baskets, decorative boxes and other re-usable containers are a fabulous addition to the gift itself and can be relegated to a practical purpose. 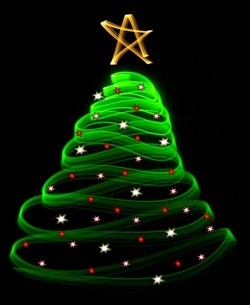 - The Christmas tree itself has an influence on the environment no matter which type you choose. Although it would seem like the greenest option, the living, potted Christmas tree does not do well indoors and rarely survives long enough to be planted in it's forever spot. Evergreen trees thrive in cold weather in the winter and if you keep your potted tree outside or in an unheated area it is much more likely to survive. Cut trees are usually farmed and tended for the purpose of harvesting for the Christmas season. To keep the environmental impact lower, select trees from local farms and keep them on the small side. Additionally, having the tree chipped and composted (where community programs exist) makes the fresh cut tree and even better eco Christmas strategy. The production and transport of artificial trees has a negative environmental impact however... of all the options, the artificial tree may just be the greenest. As long as you select a quality tree and commit to your tree for a 10 (or better yet) 20 year period the manufacturing and transport impact can be minimized when factored over that time frame. - It's beautiful, but it's expensive and there's a safety issue that goes along with traditional lighting. Cut your Christmas lighting costs by 90% simply by switching to LED Christmas Lights. Available in a wide variety of colors and color mixes, Eco Christmas lighting options include strings of LED indoor and outdoor lights, rope lighting, icicle displays and Christmas tree lights. A huge benefit to LED lighting is that light emitting diodes produce lots of light but very little heat. This dramatically decreases the possibility of a devastating house fire. I love tiny lights, so naturally my favorite Christmas lighting is LED Indoor/Outdoor Bethlehem Lighting for wrapping around garland, banisters and archways (I liked them so well that I never removed them from the arched entry into the living room). - When you're offered the choice of produce and turkeys from local sources choose them over imported goods. Buying from local farms and markets leads to less packaging, less transport and a thriving business atmosphere in your community and those surrounding it. - Gift giving means garbage, at least the conventional type of gift giving does; some simple tweaking in your gift buying routine can keep wrapping paper, ribbon, blister packaging and tons of cardboard from clogging the local landfill. About 10 years ago (2001) we did a re-evaluation of our Christmas gift giving and made some decisions that reduced gift waste and dramatically increased global awareness among our nieces and nephews. We normally spent between $20 and $25 per kid and once they reached their early teens we realized how small an impact our gifts actually made in their lives and how dynamic an impact that money could make on someone else's life. So, based on the premise "Want to feel happy? Make someone else happy!" we decided to donate the money we would normally spend on them to make a difference in someone else's life. We were very pleasantly surprised at the positive reaction from ALL of the kids. It opened new lines of communication between us and discussions about where they would like to see the money go. We've (or rather they have) bought goats and chickens and rabbits for World Vision to distribute to needy families. Once the kids understood how much difference these gifts made to a family it made them very happy to be a part of it. Animal shelters and "Save the Whale" have also received Christmas donations from the kids. This page was written to give you some ideas for celebrating a wholesome, green Christmas... No sacrifices, just good clean fun! Do YOU have a great eco Christmas tip you'd like to add? Just jot it below. Share your environmentally friendly Christmas hints. Do you have a great green tip for celebrating the Holidays? Visitors to our Eco Christmas page may also be interested in the following pages.